The Scotchman Peaks Wilderness Act of 2016 would protect a rugged range of mountains on the Montana border, near the city of Sandpoint and Lake Pend Oreille. Its low-elevation boreal and old-growth forests support a unique diversity of plants and Canada lynx, wolverine, mountain goats, moose and grizzly bears. The bill, introduced at the request of the Bonner County Board of Commissioners, has wide support including one of Idaho’s largest forest products companies and the Greater Sandpoint Chamber of Commerce. Support for Scotchman Peaks wilderness dates to the late 1970s. But in 2005, the Friends of Scotchman Peaks formed specifically to organize community support for wilderness designation for the area. “Sen. 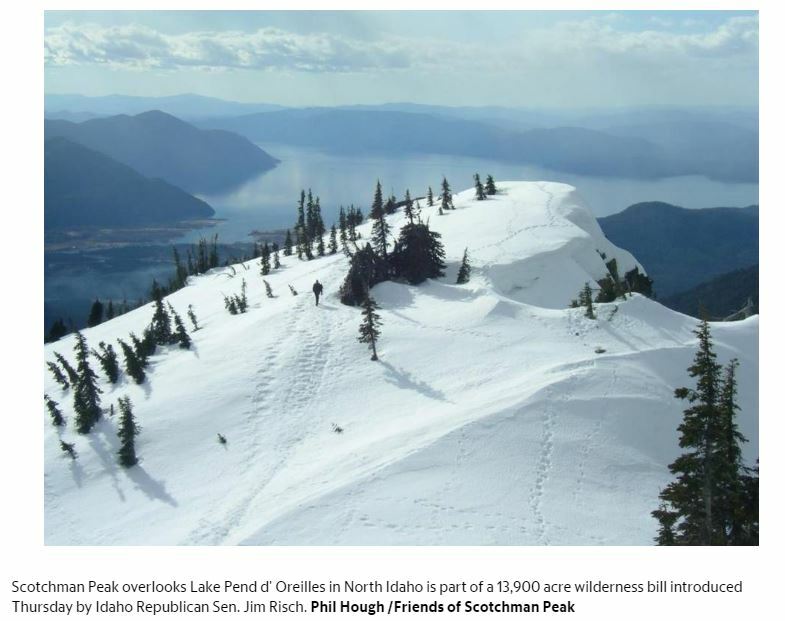 Risch’s support of the homegrown Scotchman Peaks wilderness campaign reflects the far-reaching community support for permanent protection of one of Idaho’s often overlooked wild gems,” said Craig Gehrke, Idaho state director for The Wilderness Society.